President Chesbrough comments on accomplishments, challenges, and the College’s value in serving students. Carlos A. Pimentel, Esq., a music, sports, and film industries professional shared his formula for career success with Cazenovia College students. In his lecture, Pimentel explained how he used networking to open doors, allowing him to enter various entertainment industries. Cazenovia College is pleased to announce four updates to the curriculum. They include a new Finance Program offering Bachelor of Science and Bachelor of Professional Studies degrees—over a four-year period or a three-year accelerated period; a business management concentration of the Management Program now available as a three-year accelerated course of study; and, an Individual Studies Program offering the Bachelor of Science degree. During the 76th annual conference held by the New York State Communication Association (NYSCA), six students and six professors presented their research. This year's theme, Signs of the Time, directed participants to focus on the changing political environment – a continually growing emphasis in the field of health communication – and the speed and urgency of organizational environments influenced by technology. Cazenovia College’s Equine Ambassadors Club (EAC) invited local trick-or-treaters to meet the College’s five miniature horses, Winston, Caleb, Ian, Don and Ray, this Halloween. The EAC teamed up with four other campus clubs including the Honors Society, Drama Club, Spilled Ink, and Safe Space at Caz (SPAC) to Trick-or-Treat for UNICEF this Halloween. Cazenovia College announces several changes to key administrative positions. Meet Liz Dobson, Communication Studies major from Billings, Montana, and learn how her Cazenovia College experience has provided her with leadership skills and personal development to be successful after graduation. Meet Hunter Middleton-Tompkins, Fashion Merchandising major from Munnsville, New York, and learn what she enjoys about being a Cazenovia College athlete. From the day Breanna Burrows stepped onto the Cazenovia College campus, she knew that she had found the perfect fit to continue her education. She says, "I chose Cazenovia College because of the family atmosphere. I immediately felt at home and like this is where I belonged." Meet Megan Lawson-Clark, Fashion Studies Assistant Professor and Fashion Merchandising Program Director at Cazenovia College. Lawson-Clark is dedicated to helping students gain real world experience and networking opportunities. Cazenovia College senior forward Michaela Breeze made history by becoming the Wildcats' first student-athlete to appear in Sports Illustrated magazine. The North Eastern Athletic Conference (NEAC) announced its 2018 Women's Cross Country All-Conference selections, honoring the top 21 finishers in the NEAC Championship race on October 27. Four Wildcats were named to the Cross Country All-Conference Team. The North Eastern Athletic Conference (NEAC) selected its 2018 Women's Soccer All-Conference Team with 33 student-athletes receiving the league's top honors. 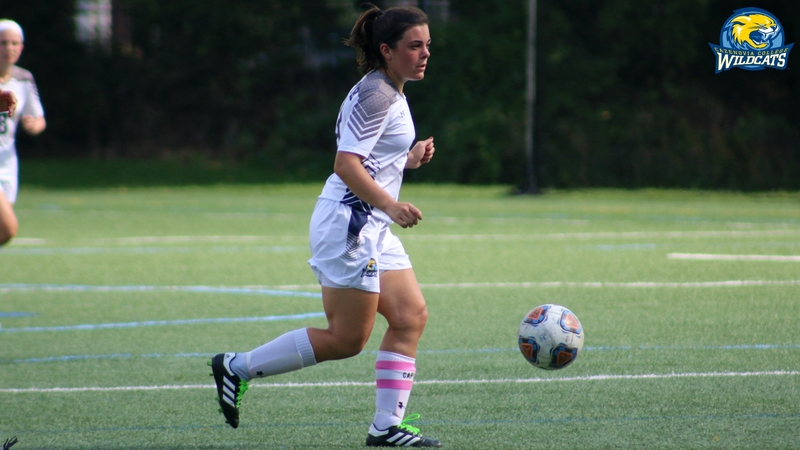 Cazenovia College placed five women's soccer players on this year's All-Conference team. Cazenovia College hosted a "Science Night" in the laboratories of Eckel Hall. Students from several academic programs set up stations throughout the building. Children from the local community were able to explore biology, chemistry, psychology, and forensics at hands-on stations in the science labs. On Sunday, September 30, our Environmental Biology and Biology students held a "BioBlitz" event for kids of all ages. Families were invited to learn about local fish, amphibians, plants, and invertebrates at Lakeside Park. They participated in various stations as they filled out their BioBlitz Passport. Thank you to our students and faculty for making this a fun afternoon for the community! And thank you to the Village of Cazenovia for allowing us to use Lakeside Park!